Where did the two natural satellites of Mars, Phobos and Deimos, come from? For a long time, their shape suggested that they were asteroids captured by Mars. However, the shape and course of their orbits contradict this hypothesis. Two independent and complementary studies provide an answer to this question. One of these studies, to be published in The Astrophysical Journal and predominantly conducted by researchers from the CNRS and Aix-Marseille Université, rules out the capture of asteroids, and shows that the only scenario compatible with the surface properties of Phobos and Deimos is that of a giant collision. In the second study, a team of French, Belgian, and Japanese researchers, including Sébastien Charnoz from the UnivEarthS team “From dust to planets”, used cutting-edge digital simulations to show how these satellites were able to form from the debris of a gigantic collision between Mars and a protoplanet one-third its size. This research, which is the result of collaboration between researchers from Université Paris Diderot and Royal Observatory of Belgium, in collaboration with the CNRS, Université de Rennes and the Japanese Institute ELSI, is published on July 4, 2016 in the journal Nature Geoscience. The origin of the two Martian moons, Phobos and Deimos, remained a mystery. Due to their small size and irregular shape, they strongly resembled asteroids, but no one understood how Mars could have « captured » them and made them into satellites with almost circular and equatorial orbits. According to a competing theory, toward the end of its formation Mars suffered a giant collision with a protoplanet: but why did the debris from such an impact create two small satellites instead of one enormous moon, like the Earth’s? A third possibility is that Phobos and Deimos formed at the same time as Mars, which would entail that they have the same composition as their planet, although their low density seems to contradict this hypothesis. Two independent studies have now solved the puzzle: the Martian moons must have arised from a giant collision. In one of these studies, a team of Belgian, French, and Japanese researchers offers, for the first time, a complete and coherent scenario for the formation of Phobos and Deimos, which would have been created following a collision between Mars and a primordial body one-third its size, 100 to 800 million years after the beginning of the planet’s formation. According to researchers, the debris from this collision formed a very wide disk around Mars, made up of a dense inner part composed of matter in fusion, and a very thin outer part primarily of gas. In the inner part of this disk formed a moon one thousand times the size of Phobos, which has since disappeared. The gravitational interactions created in the outer disk by this massive star apparently acted as a catalyst for the gathering of debris to form other smaller, more distant moons. After a few thousand years, Mars was surrounded by a group of approximately ten small moons and one enormous moon. A few million years later, once the debris disk had dissipated, the tidal effects of Mars brought most of these satellites back down onto the planet, including the very large moon. Only the two most distant small moons, Phobos and Deimos, remained. Due to the diversity of physical phenomena involved, no digital simulation is able to modelize the entire process. Pascal Rosenblatt and Sébastien Charnoz’s team thus had to combine three successive cutting-edge simulations in order to provide an account of the physics behind the giant collision, the dynamics of the debris resulting from the impact and its accretion to form satellites, and the long-term evolution of these satellites. In a second study, researchers from the Laboratoire d’astrophysique de Marseille (CNRS/Aix-Marseille Université) ruled out the possibility of a capture on the grounds of statistical arguments based on the based on the compositional diversity of the asteroid belt. They moreover show that the light signature emitted by Phobos and Deimos is incompatible with that of the primordial matter that formed Mars (meteorites such as ordinary chondrite, enstatite chondrite and/or angrite). They therefore support the collision scenario. From this light signature they deduced that the satellites are made of fine-grained dust (smaller than a micrometer). Yet the very small size of grains on the surface of Phobos and Deimos cannot, according to the researchers, be solely explained as the consequence of erosion from bombardment by interplanetary dust. This means that the satellites were from the beginning made up of very fine grains, which can only form by gas condensation in the outer area of the debris disk (and not from the magma present in the inner part). Both studies are in agreement on this point. Moreover, the formation of Martian moons from these very fine grains could also be responsible for a high internal porosity, which would explain their surprisingly low density. 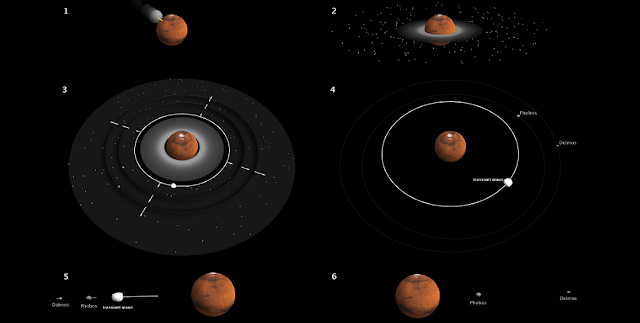 The theory of the giant collision, which is corroborated by these two independent studies, could explain why the northern hemisphere of Mars has a lower altitude than the southern hemisphere: the Borealis basin is most probably the remains of a giant collision, such as the one that in fine gave birth to Phobos and Deimos. It also helps explain why Mars has two satellites instead of a single one like our Moon, which was also created by a giant collision. This research suggests that the satellite systems that were created depended on the planet’s rotational velocity, because at the time Earth was rotating very quickly (in less than four hours), whereas Mars turned six times more slowly. New observations will soon make it possible to know more about the age and composition of Martian moons. Japan’s space agency (JAXA) has decided to launch a mission in 2022, named Mars Moons Exploration (MMX), which will bring back samples from Phobos to Earth in 2027. Their analysis could confirm or invalidate this scenario. The European Space Agency (ESA) has planned a similar mission in 2024 in association with the Russian space agency (Roscosmos).